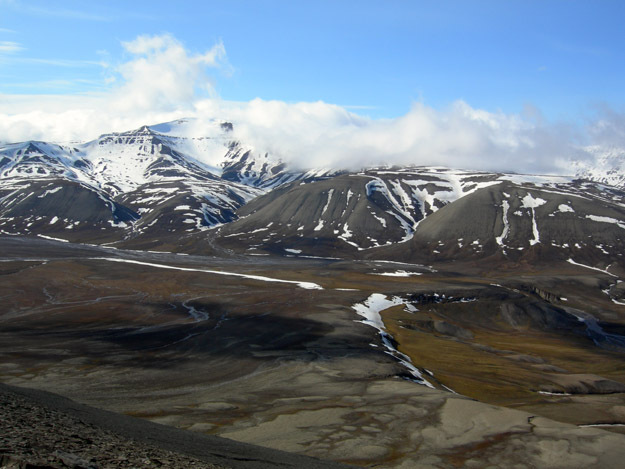 SVALBARD, NORWAY–A geological high adventure today when I joined a field trip of Norwegian faculty and international graduate students on a day trip to a Triassic section north of Longyearbyen. We met at the University of Norway research station (a fantastic facility) for orientation and equipment. My host is Maria Jensen, a Norwegian geologist who specializes in siliciclastic sedimentology and stratigraphy. University of Norway research station (UNIS) in Longyearbyen. We then were issued survival suits (always a good sign), rifles (not for me, unfortunately), helmets, and other gear. We were a group of ten, so we loaded into a single Zodiac boat. I was the last onboard because I had difficulty on the dock in the cold wind putting on my survival suit, which is one piece with built-in boots and gloves. (Students jump in and out of them — not me! I felt like an astronaut … or a very big toddler). Luckily the only thing I dropped in the ocean was my helmet, which I grabbed back. Since I was last in the boat, I had the privilege of being bounced around in the bow on our long trip across heavy seas (well, to me). I held up my end, though. 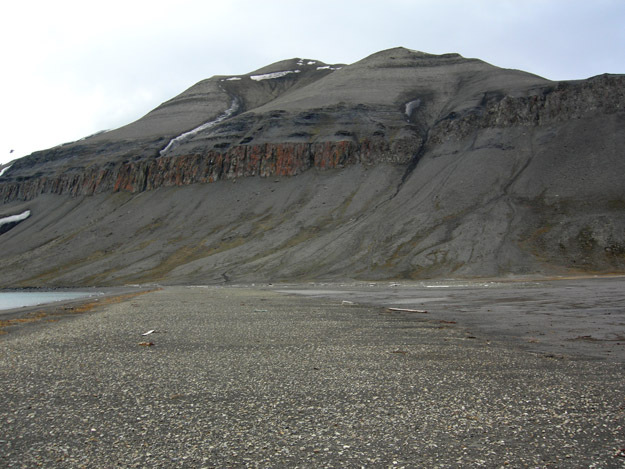 Outcrops of Triassic rocks near Diasbodden, Svalbard. N78.34480°, E16.36062°. View from the Triassic outcrops into a nearby valley. Note blue sky which appeared for a few hours. View from N78.33986°, E16.35474°. I’ll post later about the geology when I get a better connection. It was incredible. I was even able to make a few contributions as the only paleontologist on the trip. 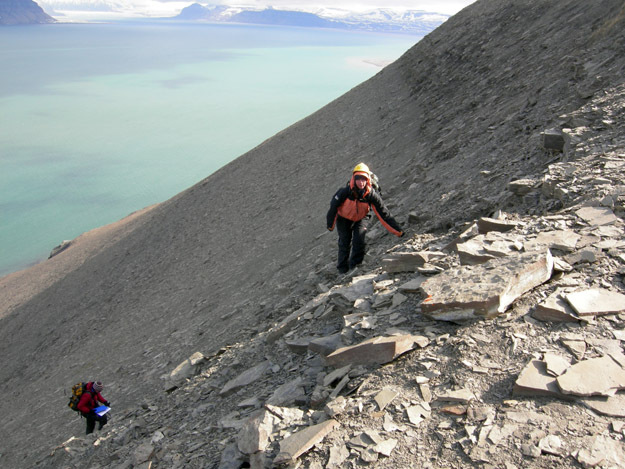 The steep terrain we worked on above the fjord. Maria Jensen is on the right. Another even bumpier and wetter ride back to Longyearbyen. (I grip to the few ropes for life itself while students slept beside me unconcerned.) No bears on this expedition, but a few reindeer and lots of shore birds. A fantastic experience for geology, wilderness, and adventure.